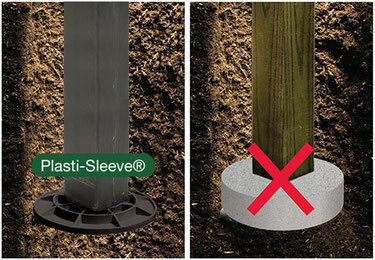 Replaces Concrete Footings of Equal Diameter - Plasti-Sleeve - The original in post frame protection! 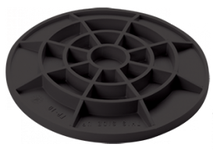 FootingPad® has been designed and engineered to replace concrete footings of equal diameter. They have been thoroughly tested by NTA Testing Laboratories and the ICC-ES Evaluation Services. 10″ & 12″ FootingPad will support a 4×4 or larger post. 16″ FootingPad will support a 6×6 or larger post. Allowable loads are controlled by the type of supporting soil. NTA Tested by NTA Testing Laboratories in accordance with International Code Council Evaluation Service (AC49). ICC FootingPad meets the ICC-ES building code acceptance criteria (AC49). ENVIRONMENTALLY FREINDLY FootingPad is made from recycled materials. The color of pads may vary. PATENTED TECHNOLOGY FootingPad is a patented Technology. Patent number 7827747.